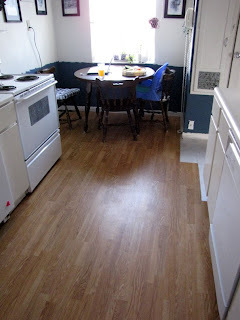 one new and improved and made from recycled (wood) materials and recyclable wooden floor. It isn't finished (we ran out of flooring) but it's expected to be finished tonight. Coving and all. I'm so, so in love with it. Even unfinished! Wow! Looks amazing. You have a new kitchen! 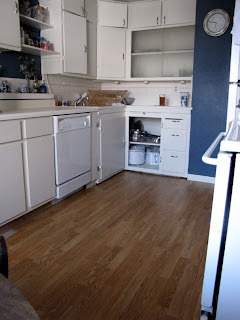 I've always loved your vintage kitchen, the original cabinets and tile counters. Looks great with the new floor. I love your kitchen, too! I love the steel colors mixed with the sunflower colors! It looks so nice. Crisp and clean. I agree. It's gorgeous! We've just stuck to pulling up carpet to reveal the 40 year old wood underneath. Not as pretty, but probably much easier. 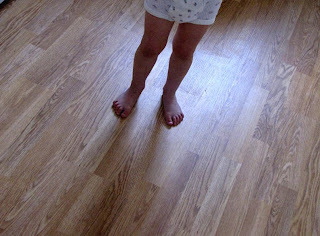 Wendy - we have wood floors underneath our carpets - our house is circa 1950, so i'm sure they're original, still. From what I've seen (ripped the carpet up to spy underneath) there are patches and what looks to be cement fill-ins. ??? I've yet to be brave enough to just rip up the whole dang thing to see how bad of shape it's in! But I absolutely will eventually. It's gorgeous. I can see why you're in love. mmmm. wood floors. so pretty.